A few weeks ago I posted a very popular post about how to make your own body butter. I had some questions about the way I got my oils to whip up so light and fluffy, so I wanted to make you guys a video to show you exactly how I make this creamy goodness in a step-by-step video tutorial. This is not my Youtube debut, but it IS the first time I’ve ever spliced clips of footage together and added music, so I apologize in advance for my lack of editing skills. There is a reason I am a blogger and not a Youtuber! Still this was a fun post to create for you guys today, and I hope you enjoy it! About 30-40 drops of Young Living essential oils of your choice. 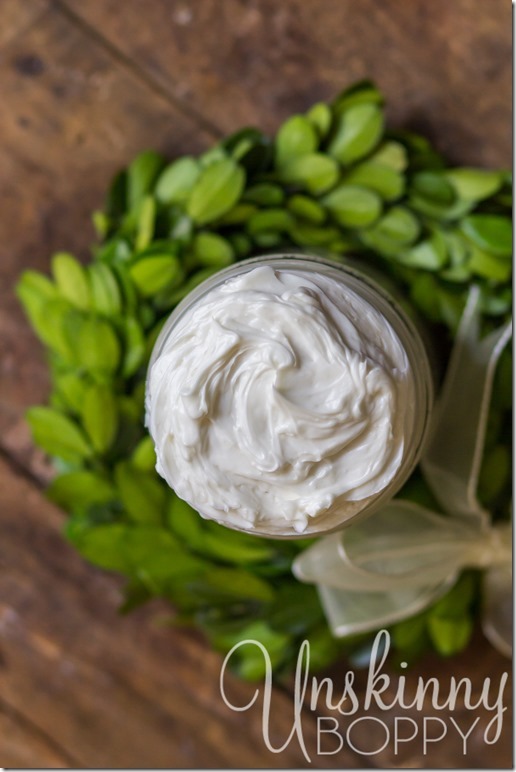 Using a saucepan over low heat, melt the coconut oil and Shea butter together completely until they are liquefied. Pour into a stainless steel bowl (I used my Kitchenaid mixing bowl) then sit it in fridge. Once it starts to harden back up so that you can see your fingerprint in it (this could take anywhere from a few hours to overnight), whip it up for a few minutes with the mixer until it is light and fluffy like cake icing. 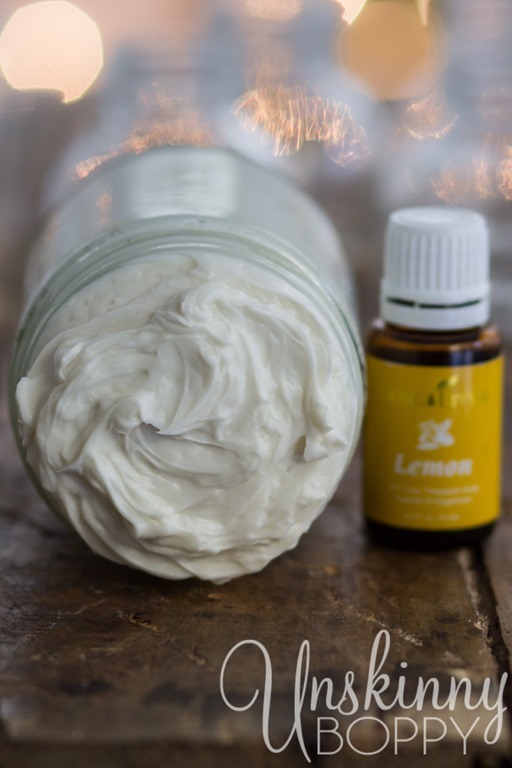 Slowly add the liquid carrier oil as it is whipping, along with any essential oils you want to add. This recipe makes about two to four cups of whipped body butter, depending on how much whipping you do! More air= more volume. My Kitchenaid whisk attachment makes mine extra-fluffy so I get a lot out of this recipe. You can use regular hand mixer with beaters but I don’t know if it will get quite so light and fluffy because it won’t be as incorporated with air. Now wasn’t that simple? I promise, it’s VERY easy to make! The end result should be a heavy whipped cream consistency that doesn’t budge from the container, even when you turn it upside down and sideways…. 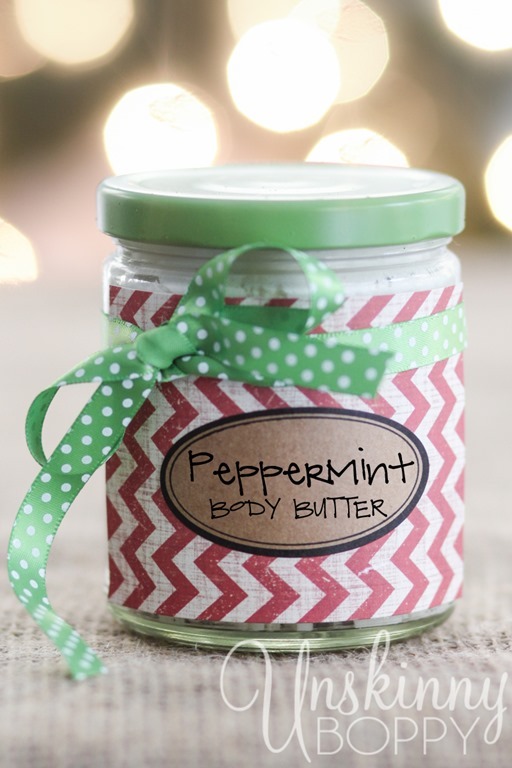 This body butter will make such a great gift for lots of folks on your Christmas list this year. I’m kinda digging the way it looks in a plain glass jar (this is my leftover spice jar). But if you’re feeling festive and want to put some easy labels onto yours as gifts, just gather up some crafting supplies and get to work. 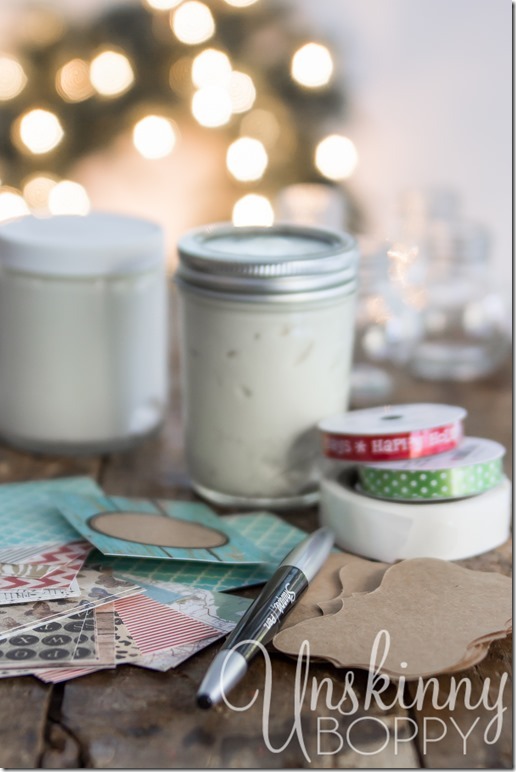 Find some fun chevron or reclaimed wood scrapbooking paper, and use glue dots to attach the paper to the jars. 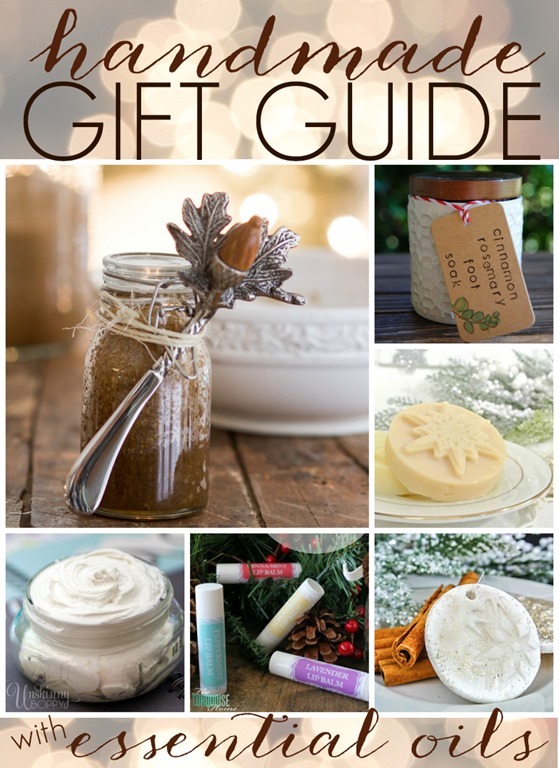 Add a label and some ribbon, and you’ve got yourself a gift! You can print your own Avery labels on their website. They have some super cute designs these days. I spray painted the lid of an old jam jar for this cute peppermint body butter container. Doesn’t this scream Christmas? 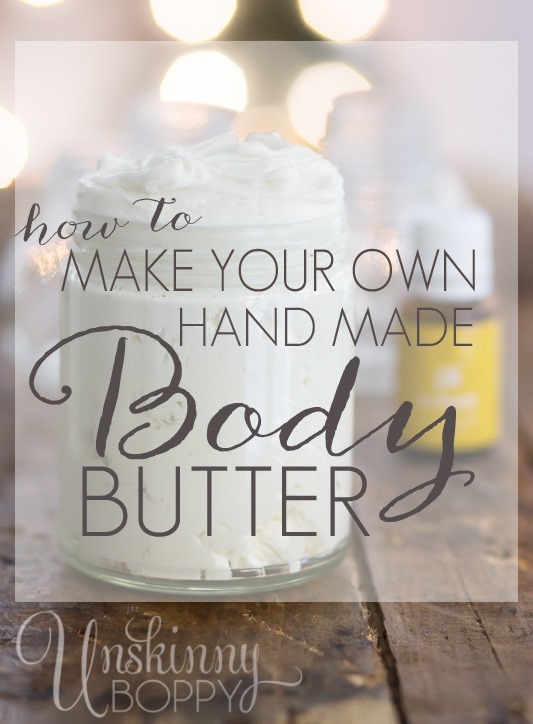 Y’all have fun making this body butter at home! 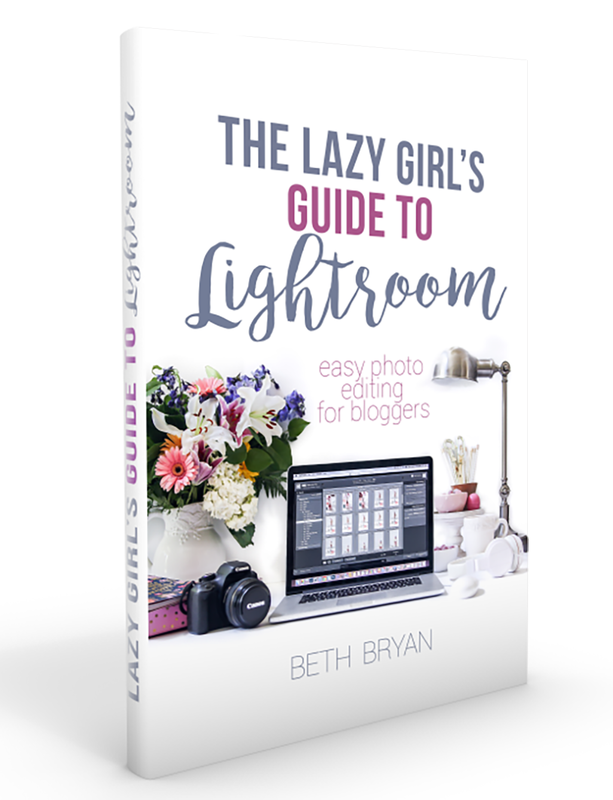 Be sure to check out the other great ideas featured at my friend’s blogs today. We’ve assembled a whole bunch of handmade gift ideas so please hop around to all of our blogs and check out the great gift ideas using essential oils this holiday! I look forward to making ALL of these! I cannot see or hear you in a video without grinning ear to ear the entire time. Loved your clip, and am totally obsessed over this DIY!! I absolutely have to give it a try. My scaly dry Wisconsin girl legs practically crawled through my laptop to dip into that mixing bowl. Love this! Hi, I’m wondering how many jars were you able to fill with that one batch? Were they 4 oz. jars? Thanks for the great tutorial! Hey Erin-This recipe makes about 1-2 cups, depending on how much air you incorporate when you are whipping it up. More air=more volume. You could fill about 3-4 four ounce jars with this recipe, I believe. Love your web page! Please send me more of your ideas! Thank you for the video! I never realized that I wasn’t letting mine harden enough and I wasn’t whipping it long enough! I’m new to your website and love it! Since there are no preservatives, how long does this last before going bad? 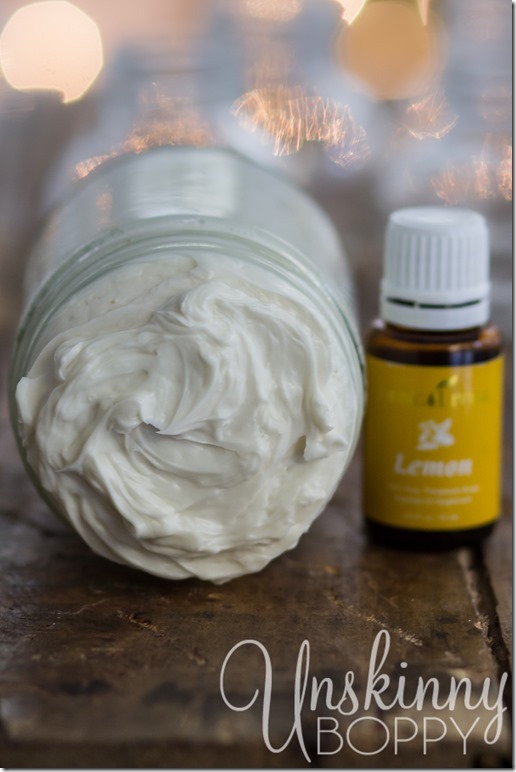 Do you have photo sensitivity problems using the citrus oils? Love this website. Thank you for sharing. I made this today. We will see how it turns out. Can this be kept at room temperature or should it be refrigerated? Room temp should be fine. The only time I’ve had an issue is mailing it in summertime. first video I’ve been able to watch someone actually make it! Looks great! Question though, am I able to separate the amount when fully whipped so that I can make different creams? A face cream, night time cream for kids, ect? Can you tell me about how many pounds of shea butter I will need if I am planning on making twelve 12oz jars of this? 4 ounces of shea butter makes about 16-24 oz of body butter in this recipe when combined with other ingredients. 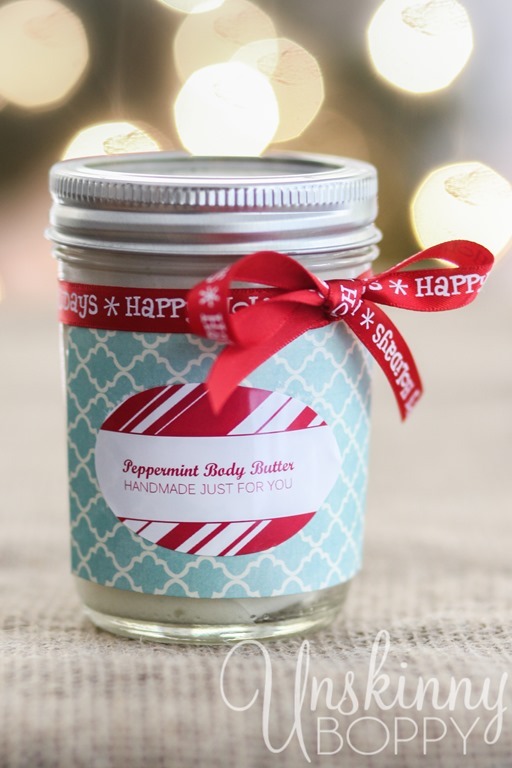 I don’t 100% trust my pregnancy brain to do the math here, but I believe you would need about 36 oz (a little over 2 lbs) to get 144 ounces of body butter for your batch. You might want to have somebody smarter than me check my math on that though. Hello! Me again. 🙂 I had one question. I am doing a make & take class and doing this. Can they add their 30 drop of essential oils much later (days) and mix it in? We won’t have time to make the whole thing at the party. 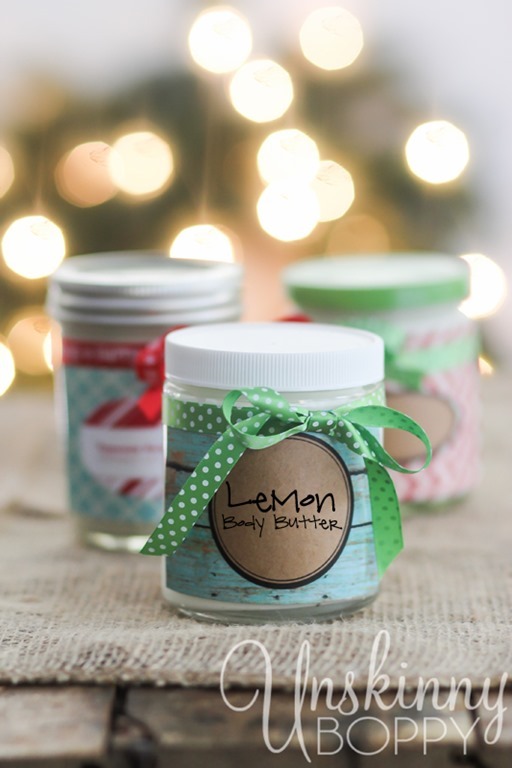 So I wanted to get it all ready so all they need to do is pick the EO’s they want to put in the body butter, mix them in and then put in a mason jar and decorate their jar. Any help would be so appreciated! 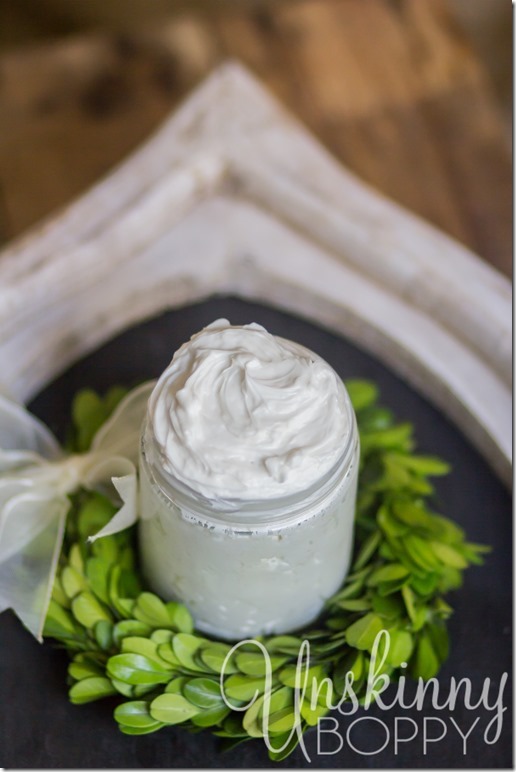 I have been making whipped body butter for awhile but mine doesn’t look as fluffy as yours does. Mine tends to be so firm it is difficult to put in the jar. Any ideas of what I might be doing wrong? I can’t wait to make this for christmas gifts, do you know how long the body butter lasts for? I was just wondering how does the body butter last before going bad? This came out really runny for me after 10 minute whip. Help? Mine came out very runny as well. I chilled the melted oils, began mixing after they were set up, added the carrier oil, jojoba and sweet almond, and YL oils and both batches are runny. On my second attempt I mixed for quite a while before adding the carriers but I did not even get the 4 oz all in before it turned into a runny liquid again. These are gifts and not sure what the problem is ! Please give me some suggestions quickly! Dear Beth, would you share any secrets on how I can make this butter less oily? Also, does it melt easily? Followed the instructions exactly and use the exact ingredients listed and it did not whip up. Have a soupy nothing at this point. Used my Kitchenaide mixer with the whisk. Now what? Otherwise it’s a waste! Me too! Please someone help! I made some for gifts and they look like mush! When I had these issues Beth responded with the following and it worked for me! Try whipping in about 2 T. melted beeswax into the mixture, then cool it all down again and and re-whip. It should solidify with the beeswax. 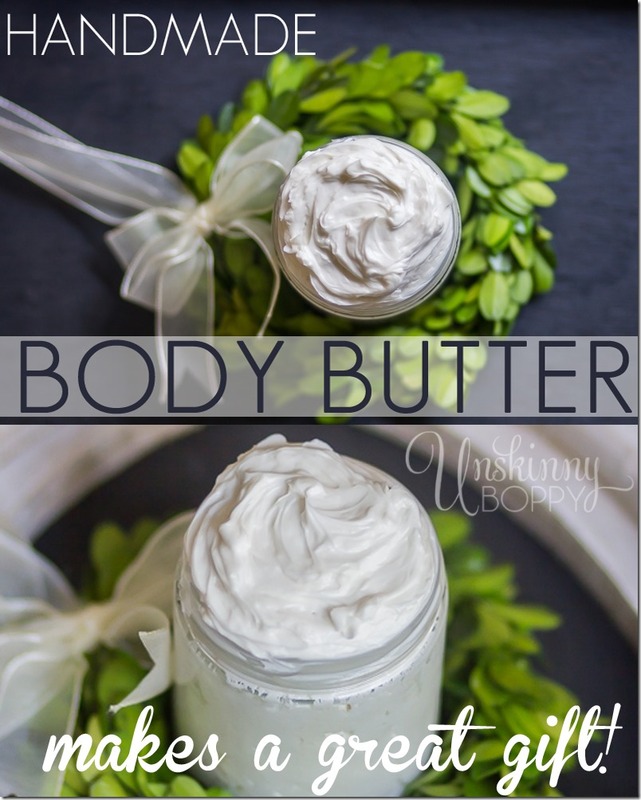 Great recipe for Body Butter! I received a small pot of it as a gift from a friend & now I am making some for my daughter. Thanks! !